A man tailgate bar and sauce rack. Now the corrugated tailgate can be used as actual prep surface and my collection of hot and tasty sauces has a home. Good idea. Love the Cruzan Sign. Will you be grilling the human organs? Great idea. Love the Cruzon sign. Mmmmm... all those hot and tasty sauces to spice up your organs! 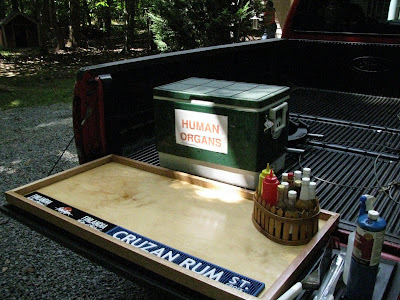 Well the "Human Organs" is an attempt to keep prying hands out of my beer stash. Plus it is always a good conversation starter. Last night however a buddy of mine who had a liver transplant was fishing around for a beer and got a good laugh too. Are You At Your Desk?